Adoption Fee: Adoption fee is waived in lieu of qualified adopter helping to pay for all or a portion of a horse’s return stateside. 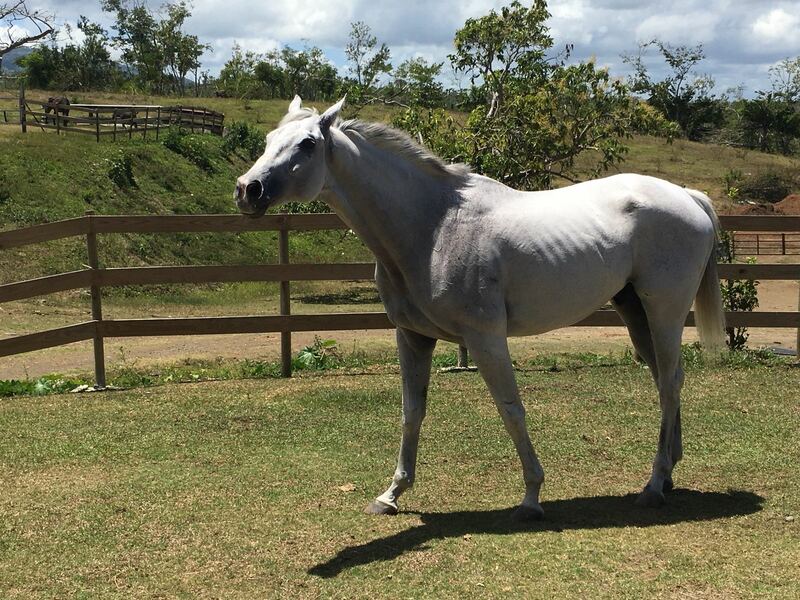 Cost to return a horse stateside to Florida from PR is $3,000 – 3,500 (this including required 7 day-night USDA quarantine, all veterinary fees and transport paperwork, flight to Miami and trailering to Ocala area. *This doesn’t include trailering to final home). Concertos Song is an iron horse. He retired after racing for 11 years (his first race was 7/21/07), making an incredible 126 starts and racing up and down the US mainland east coast and then in Puerto Rico. He is also a hurricane survivor, having endured the destruction Maria caused to the backstretch of Hipodromo Racetrack September 20, 2017 (90% of barns to lose their roofs, flooding in barns and shedrows, twisted metal and debris, and loss of running water and no forage for weeks while relief was being organized from stateside). Concertos Song is classy & is “gorgeous” to ride. 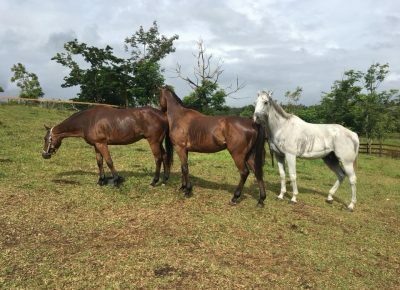 He’s turned out with other gelding; he gets along with both people and other horses. 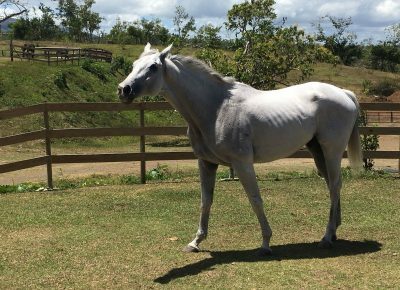 He’s been spending most days out in a large field paddock with other geldings, “just being a horse”, letting down and re-gaining weight. Recent X-rays taken in late June 2018 of his feet and legs were surprisingly clean given his long campaign on the track (X-rays available to prospective adopters). 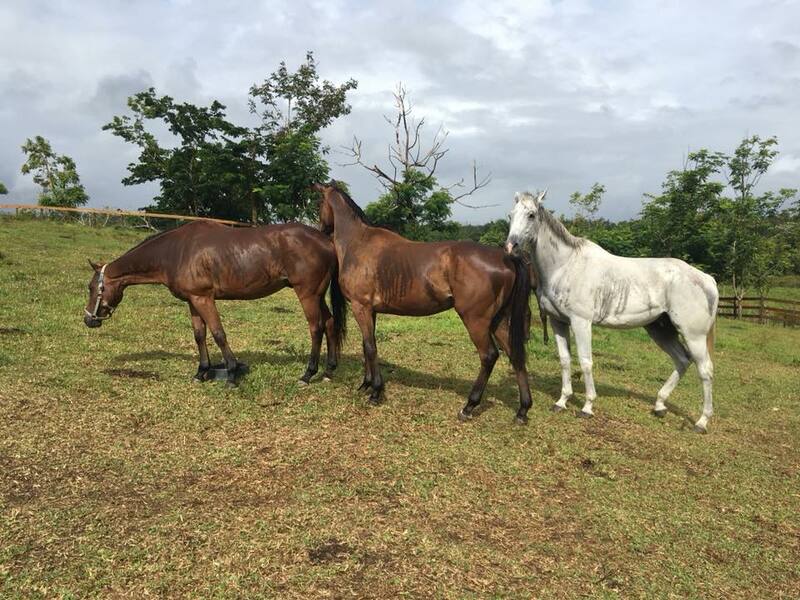 The equine veterinary surgeon, who conducts a PPE-type evaluation on all horses being considered for retirement to CTA, deemed him sound and suitable for an athletic 2nd career. He is somewhat thin soled, so the veterinarian is recommending “specific shoeing (impression material etc) to give him some cushioning to handle rough terrain” if that is his adopter’s intent with him. He has been worked and ridden in round-pen and ridden on trails and in an arena a few times, but he hasn’t gone through targeted or specified re-training (we’ve been letting him “be a horse”). When he is saddled and has a bit in his mouth, he can be strong and wanting to “go” (something that isn’t unusual in war horses used to having jockey get on them and then hit the gas). 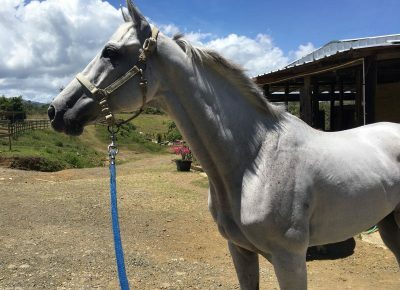 We’ve been working with him in a Parelli halter on the ground, and we think working bitless in the saddle may also help him not feel compelled to just go. He is brave on trails, and did we say he feels beautiful under saddle? 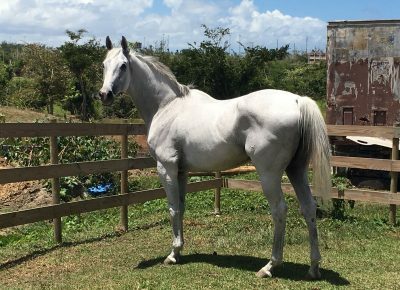 We think anyone willing to provide him with a period of consistent ground and in-the-saddle work will be rewarded with a horse that is not only beautiful to ride, but also a gorgeous mover with a big, kind heart! We can see him mastering the trails, as well as lower-to-intermediate level field hunt, lower-level jumping, and even dressage (he cleans up beautifully). The long campaign at the track and his heartiness shows he is a “solid citizen” of a horse who will do what he believes his rider wants (you just must work with him some to teach him what it is you want of him)! **Sold to non-racing homes only. Any known information or vices are disclosed. CTA will provide qualified adopters with diagnostic / prognostic images (x-rays, ultrasound), other evaluation information, photos and videos of horse. Further, arrangement can be made to speak with equine veterinarian who evaluated horse. Additional pictures and video on request to serious inquiries.